The No. 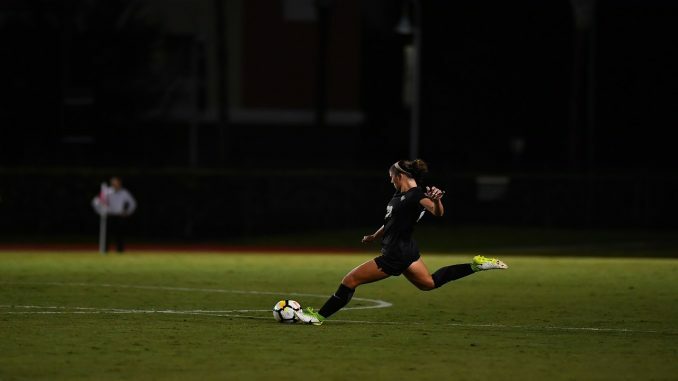 7 UCF Knights extended their unbeaten streak to 12 games after beating the UConn Huskies 2-0 Thursday night at the UCF Soccer Complex. The Knights (11-1-1, 6-0-1 AAC) collected their eighth shutout of the season behind strong defensive efforts from senior defender Kathellen Sousa. With the Knights coming into this game hot offensively, the Huskies’, a team that had traditionally pressed UCF, played very defensively, dropping back many of their players. This allowed the Knights to dominate possession for much of the game, but it also frustrated them on offense. After UCF put pressure on the UConn (6-7-3, 4-3-0 AAC) defense for a majority of the first half, the Knights took the lead in the 29th minute when off a cross from sophomore midfielder Katriina Kuoksa found reigning AAC offensive player of week Morgan Ferrara for her 12th goal of the season. UCF ended the half with 10 shots, five being on goal. “It was a great team goal, I just had to finish it off. I think that it was a big-time goal in the sense of we needed it at that point in the game to calm down, to calm everyone down.” said Ferrara. The second half was nearly identical to the first, as the Knights would dominate the ball once again. UCF would double its lead and seal the game when a corner kick from Carrie Lawrence came off the head of Sousa and fell to senior midfielder Bridget Callahan, who put it in the back of the net. After that goal, the Knights coasted the rest of the way. Junior goalkeeper Vera Varis only finished with one save, mostly due to the high volume of possession and good defense in front of her. “I have so much trust in this whole and the back four is working really, really well.” Said Varis. Though the Knight’s weren’t as dominant on paper this game, these are the kinds of games that will prepare them for the postseason. The Knight’s next game is at home against Temple.